SFS is recommended for locations with moderate sunshine and intense moisture. 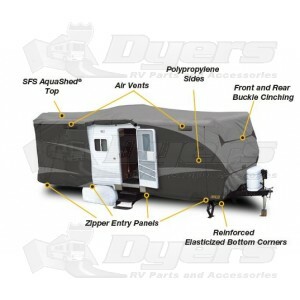 SFS AquaShed RV covers are great for high moisture climates. Provides triple the protection compared to standard covers. Polypropylene sides ensure maximum breathability and virtually eliminate mold and mildew. Triple layer top panel beads water on contact to resist high humidity and rainfall, plus protect against UV rays. Strap and buckle attachments prevent billowing in windy locations. Reinforced, elasticized corners resist tears and snags. Short size intervals provide optimum fit. For proper fit, make sure to include bumpers, ladder and spare tire when measuring your RV. You can exclude ground clearance. Made to accommodate roof-top accessories such as A/C. Scaled to fit Travel Trailers up to 100" wide and 90" tall.